Ray Ban RB 3447 Round Metal - Gold w/ Aqua Green Mirror Polarized Need Help? Ray Ban sunglasses are world renowned for their classic American styling. The RB 3447 Round Metal sunglasses are a great example of vintage Ray Ban at its best, with its round metal shape and very well proportioned fit. The frames are handmade in Italy with beautiful filigree detailing. 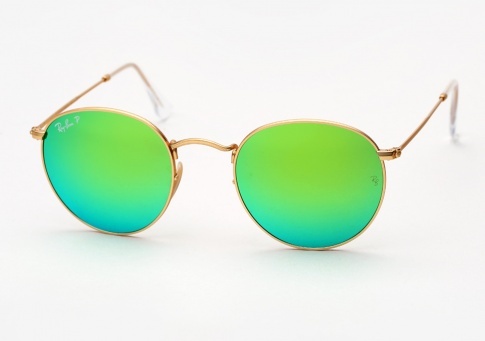 We see them here juxtaposed with aqua green mirrored lenses, for a modern twist on a classic staple. The lenses are polarized which eliminates reflected glare, made from hard to scratch mineral glass and finished with an anti-glare back coating. Saddle bridge w/ adjustable nose pads.